I think the most depressing thing on American television – and more so than the predictably and necessarily awful horror of stations like Fox News – are late night talk shows. While I’m too young to have anything to say about Carson, the last two stultifying decades of Leno and Letterman at 11.35pm were a miserable, stagnant waste. Leno was widely hated by his contemporaries from the start (getting Carson’s slot when everyone had assumed it was going to Letterman) and even more so by the end (screwing over Conan O’Brien in a way that deserves its own movie), though he was immensely popular with an audience of America’s 370 year olds. Letterman, for reasons I have never truly understood (but suspect may mostly be a inversion of the disgust focused on Leno), has always been heralded as the master of his craft, and championed by so many American comics. Both were equally vapid, cowardly, and tedious. Neither moved the format a millimetre further forward in their twenty years hosting a nightly programme. Both shows followed precisely the same format. An opening monologue of over-written-to-death topical gags from a writers room of comics who would never utter such banality in their own acts, delivered as only jokes written by someone else for you can be. Then some ‘wacky’ sketches or bits, accompanied by interminable gurning to camera. Then two or three interviews with celebrity guests, each rehearsed, agreed upon, signed off on by agents and managers, and then delivered in staccato question: monologue; question: monologue; request for plug: plug. No surprises, no movement, no inspiration. Accompanying this would be a house band led by a sycophantic yes-man, whose role was to laugh into a microphone at the host’s pre-scripted ad-libs, while punchlines were accompanied by brass band stings, presumably to help audiences locate them. Said studio audience’s role was to excessively clap and whoop (because laughter is a sound created by pleasant surprise at humour, while whooping and clapping can be queued) to fill perhaps a third of any show’s running time. I write all this in the past tense rather inaccurately. While Leno may have mercifully finally gone this year, Letterman is dragging his kooky looks to camera, unfathomably poorly written Top 10 Lists, and familiarity with female staff, out until May 2015. And although Jimmy Fallon may be a far more likeable person than Leno (but then again, so would a slab of concrete), and although the writing is enormously better, it’s still the same stale format being dragged further on. Meanwhile Conan’s TBS show sinks ever deeper into its own smug satisfaction, and despite its actually getting better ratings than Letterman, no one has ever met anyone who watches ABC’s Jimmy Kimmel Live Exclamation Mark. The real magic happened at 12.35. 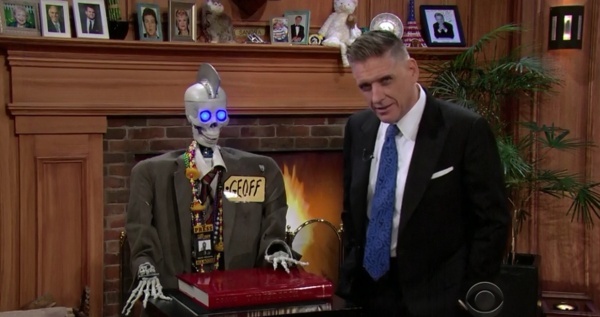 Last week saw the finish of Craig Ferguson’s ten year run on The Late Late Show. And while Ferguson couldn’t have been much clearer about his desire to get away from the show, the format, everything, it is an agonising shame that his tenure was hidden away behind Letterman, long gone midnight, scraping a million of America’s insomniac viewers. Because it was masterful. It was like nothing else on US or UK television. It was the antidote to late night talk shows, a surrealist parody of the format while still somehow actually functioning. It contained genuine joy and anger, scantily scripted, wonderfully under-written, and most importantly of all, constantly evolving. As a non-US resident, I never watched Ferguson’s show with any regularity, but instead have dipped into it for a week here, a week there, over the last few years. And in doing so, its ever-changing nature has been all the more apparent. A hugely striking contrast to seeing a recent episode of Letterman and not noticing anything different from those I’d seen in the 90s (beyond band leader Paul Schafer’s insufferability, which appears limitless in its growth). Find an episode of the Late Late Show from 2008 and you’ll see Ferguson in a barren set, alone, delivering barely scripted opening monologues to an audience that seems ever-confused that they laugh before performing their unnecessary pantomime whooping. Jump forward a year and you’ll likely see a cold opening featuring Ferguson, two or three others, and an ever-growing collective of glove puppets, miming and dancing to a pop song with extraordinary effort and clearly hefty rehearsal, for no reason other than because it was very, very silly. Leap forward a couple more years and Ferguson has added a co-host, a poorly puppeted skeleton with glowing blue eyes called Geoff, capable of barking about four or five phrases. Skip ahead again and Geoff’s now got a proper voice actor, and the two effortlessly banter through wholly improvised cold openings, establishing unscripted call-back gags that will then permeate the whole show, and very occasionally stick around as new running gags for the next few episodes. Reach the end of his run and the set now has a permanent barn door behind which stands a mute pantomime horse, with whom Ferguson occasionally dances. Letterman meanwhile sits behind his desk, repeats his scripted punchline with over-enunciation, and shows his toothy face to camera. Ferguson’s decade run on the Late Late Show is most frequently remembered and eulogised for an episode in which he opened with a ten minute furious diatribe about the treatment of celebrities in genuine trouble by shows like his own, and a promise to no longer do it. It’s not a promise he wholly kept, but it introduced a significant change in tone – gone were the cheap gags about Britney Spears’ being checked into rehab, replaced instead by far more meandering nonsense, personal anecdotes he hadn’t realised he was going to talk about, and surprisingly frank dismay about the lack of budget and promotion the network gave the programme. Some have and will also talk about how he would occasionally be extraordinarily intimate and hilarious about his own alcoholism and drug addiction, with genuine severity behind it. Those were really superb aspects to the show, and displayed a pathos where his contemporaries have only ever proffered bathos. But they’re not why I loved the show. It was the genuine desire to be funny and honest at the same time. While Ferguson’s question card tearing was a gimmick, it was one that was totemic for everything the show stood for. At the beginning of each celebrity interview (and the show didn’t struggle for booking celebrities) he would tear up the question card that every other late night host uses as a crutch, and threw the pieces behind him. He’d then floor his guest by asking something either ludicrously trivial, or deeply personal. “Do you like dogs?” he might ask of someone ostensibly there to plug their new film. A dumb question, certainly, but not one they’d prepared for with their manager in the green room. The surprise would have them answer the question honestly. And that was enough to let Ferguson pull them into his vortex of truthfulness, perhaps recalling a lost childhood pet, or telling a story about a time they were bitten causing them to become scared of the animals. He talked to celebrities like they were people, because they are people, and they ended up answering like people would, not celebrities on a talk show. If Ferguson remembered to queue up the guest’s plug (which he rarely did), there was this incredible moment of their looking dazed, as if coming around from a dream, and trying to pull themselves together enough to say their bit. Often, they’d have been so enchanted by what had happened, they’d wave him off and say, “Who cares.” Really. Or Ferguson might go the other way, like in one of the last few episodes, where he began his interview with New Girl’s Max Greenfield by asking him if he’d ever taken any class A drugs. What stands as the greatest testament to the greatness of the show was its ever-evolving nature. Where every other late night show finds its rut and then grinds it, Ferguson ditched running gags the moment he grew tired of them. Even catchphrases (“…I KNOW!”) regularly disappeared from his vocabulary. Where once there were Carson-like sketches, by the second half of the show’s ten years they mostly vanished altogether. Those dance openings had their days in 2009/2010, but things moved on. By the end he would be “warming his testicle by the fire” while improvising banter with a wobbling skeleton. It was wonderful. Really wonderful. When Colbert takes over for Letterman late next year, I really hope it can bring in change to the format, where Kimmel, O’Brien, Fallon, and Meyers have not. But what I most of all hope is that all of them will look back at some tapes of the Late Late Show (to be taken over by, and I swear this is true, James Corden) and realise how much more they could be. I have never watched much of these american late night talk shows. When I have, I’ve always been confused as to why they are so amazingly popular (due to both quality and scheduling). Craig Ferguson looks interesting. I hope he does well in his future endevours. Perhaps John meant a war initiated by Nils Bohr. i really enjoyed his longform interview with stephen fry. It was just nice to watch two people just have a chat for an hour. A bit back-slappy in places but a definite rum doings vibe about the whole thing. Actually, you’re right. He has a Rum Doings philosophy. Craig Ferguson will be missed! He regularly had Morgan Freeman on and usually talked science not whatever the newest movie happened to be. Fascinating host and guests. The late night world has lost a great star.